Syed Rahman (RCIC), member ICCRC offers services with Hart A. Kaminker, Senior Immigration Lawyer, Barrister & Solicitor, and Kieran A. Verboven (RCIC) member ICCRC. 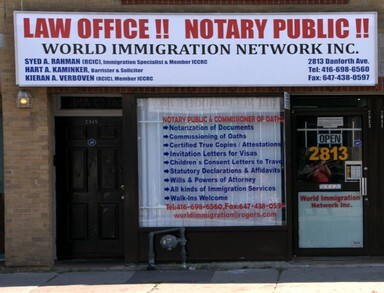 Services include: Notary Public, Commissioner of Oaths, Invitation Letters for Visas, Wills and Powers of Attorney. Registered Canadian Immigration Consultant.